Each year, most farmers protect their harvest by contracting a multi-risk insurance to cover potential losses from hazards such as frost, hail or floods. In order to detect and better coordinate the evaluation of such agricultural disasters on the ground, insurance companies increasingly utilize satellite imagery. The global overview of impacted areas, their location and the detailed information provided by the images help to optimise the efficiency of the insurance service. The global insurance company Generali contracted Airbus Defence and Space for the delivery of biophysical maps (canopy description) to assist loss adjusters to better scout damaged fields and target priority areas to be appraised. Optimising the time insurance experts spend in the field reduces the overall timeframe for the global evaluation, expedites the initiation of the compensation process and optimises costs for the company. 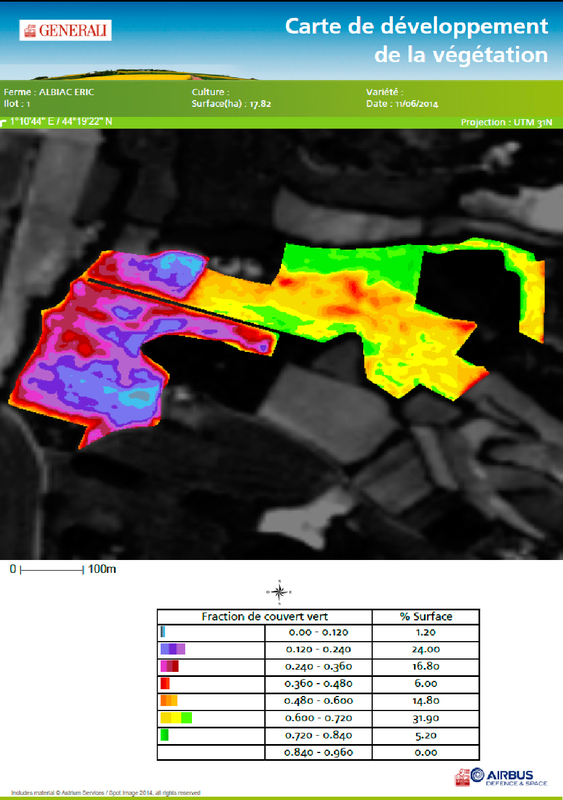 To support the assessment of fields that have suffered damage, Airbus Defence and Space provided Generali with biophysical maps derived from SPOT 6 images acquired at decisive agronomic periods. The production of the biophysical maps took place within a short timeframe to meet the customer’s needs (production of all parcels within one week, from the acquisition to the map). After digitalization of the fields on the SPOT 6 images and collecting information on the crop, biophysical processing was done using Overland™. A map representing the share of green vegetation cover was produced for each field, as shown below. Collection capacity: Thanks to SPOT 6 and SPOT 7 daily revisit capability anywhere on Earth, opportunities for cloud-free images have been drastically improved. This capacity is especially relevant for this time-critical application. High resolution and location accuracy: With 6-10m (CE90) geolocation accuracy and 1.5m resolution, SPOT 6 & 7 enable Generali to clearly detect and accurately locate the damaged areas to be checked. 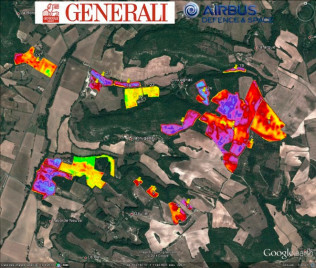 Following an assessment on the ground, Generali was very impressed with the relevancy of the maps they received from Airbus Defence and Space. The company plans to establish a prevalent use of biophysical maps derived from SPOT 6 & 7 imagery for all disaster assessment situations they will face in the coming years.